Alexei Shirov is a Grand Master from Latvia. In 1998, he place fourth in the World Chess Championship. His highest elo rating so far is 2763, attained after his victory in the 2009 M-TelMasters Tournament. 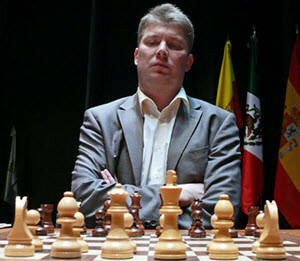 Alexei Shirov was born in Riga, Latvia on July 4, 1972. Back then, Latvia was a part of the Soviet Union. Alexei Shirov’s first wife was Veronica Alvarez. The couple resided in Tarragone, Spain and Shirov was granted Spanish citizenship in 1994. After divorcing Alvarez, Shirov married Lithuanian chess player Viktorija Čmilytė. Shirov and Čmilytė divorced in 2008. Shirov is currently living in Latvia. In 1988, Alexei Shirov won the U-16 World Championship. The following year, he became an International Master, a titled that he followed up with a Grand Master in 1990. In 1991, Shirov won the Biel Chess Tournament. In 1997, Shirov won the Ter Apel Tournament. In 1998, Shirov won the Monte Carlo Tournament. In 2000, Shirov defeated Vladimir Kramnik in a match that gave the winner the right to challenge reigning World Chess Champion Gary Kasparov. Regrettably, Shirov was for various reasons not able to play against Kasparov, and Kramnik challenged the champion instead. The year 2007 brought two close calls for Shirov. He went very far in the World Chess Championship, but was ultimately defeated by Gata Kamsky. He also reached the second round of the Candidates Tournament, but eventually lost to Levon Aronian. In 2009, Shirov won the M-TelMasters Tournament and participated in the Big Helmet Chess Tournament.